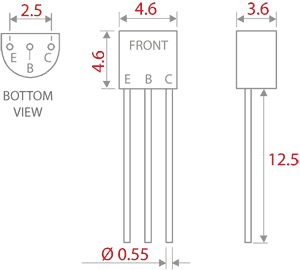 The 2N3904 is common general-purpose low-power NPN transistor used for amplifying or switching applications. It is typically used for low-current, medium voltage, and moderate speed purposes. This transistor is popular among hobbists and in academia and is arguably one of the most well-known general-purpose transistors in the world. The complementary or PNP version of the 2N3904 is the 2N3906.